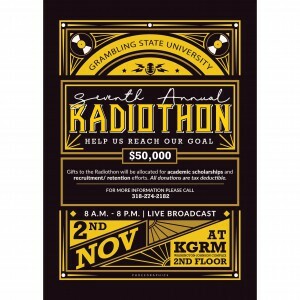 From 8 a.m. to 8 p.m., alumni, students, and faculty will take to the airwaves to show their support for Grambling State. Donate in person via check, credit card, or cash to have your name acknowledged in front of tens of thousands of listeners; and maybe even end up on air. Remember, there is no gift too small. It only takes five $20 gifts to help many students satisfy a balance to graduate. You can give in just a few clicks at www.gram.edu/giving. There you can not only donate to Bring it Home 2018. You can also designate how you would like to see your gift used; whether you want to invest in scholarships, building improvements, or other campus needs. Can’t make it to homecoming? Or, just want to let the post office do the hard work? No problem. Drop your gift in the mail by Saturday, Nov. 3, 2018, to be counted and acknowledged as a part of this year’s Bring it Home Campaign. To give now, all you need is a cellular phone. Text “GRAM 20” to 51055 from any cellular-enabled device to give in a few clicks. Your standard messaging rates will apply, but its fast, easy, and offers all of the options of giving online from any cellular device. Would you rather let us do the hard work? Call the Office of Institutional Advancement at (318) 274-2718 and we will be happy to help you make your investment over the phone. Less than $200,000 stands between us and being able to help our growing list of 5,200 students who need your help reaching their educational goals. We know, that producing the world-changing “Somebodies” that make up Grambling State takes an investment. Follow one of these five instructions invest. It’s easy: just walk, stamp, tap, type or call.